At 14,411 feet of elevation, Mount Rainier is the highest mountain in the state of Washington and of the Cascade Mountain Range. It is also the most glaciated mountain in the continental United States. 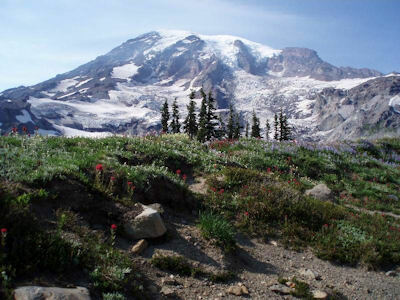 The spectacular Mount Rainier National Park has five developed areas (Longmire, Paradise, Ohanapecosh, Sunrise, and Carbon/Mowich), each varied in terrain but all offering extraordinary views and opportunities for recreation. This drive explores Ohanapecosh, Paradise and Sunrise. Our drive begins in Randle on US-12. You can reach it by taking exit 68 off I-5, however, if you are closer to Seattle or Tacoma, you can take WA-161, which will join WA-7 and at the end, turn onto US-12 East. On US-12 East, you are now driving through a corridor between the Gifford Pinchot National Forest and the drive becomes more and more beautiful as you continue. Approximately twenty-three miles from Randle, you will reach a fork in the road where WA-123 and US-12 meet and our drive continues onto WA-123. If you were to continue onto US-12, you would be heading towards White Pass. In about four miles on WA-123, you arrive at Mount Rainier National Park. An entrance fee is charged, covered by an America the Beautiful Pass. Stop at the Ohanapecosh Visitor Center (A1) to get oriented and for information on hikes and programs, and to explore exhibits on the local old-growth forest. This area of the park is open from late May to early October and is popular for camping along the Ohanapecosh River. In about a mile and a half, Stevens Canyon Road is on the left and you will use this road to head up to the Paradise side of Mount Rainier. Don’t miss the Grove of the Patriarchs (H1) Trail. This easy 1.5-mile loop hike allows for a close up look at towering old-growth Western red-cedar, Douglas-fir and Western hemlock trees, some over 1,000 years old. The trail crosses the Ohanapecosh River on a small suspension bridge. This mountain scenic drive continues winding through dense forest and every once in a while, you get a peek at the magnificent Mount Rainier! There are a few turnouts to stop and enjoy the view. On the nineteen miles to Paradise (H4), you will pass Box Canyon (H8), Lake Louise, and Reflection Lake. Just after Reflection Lake, the road turns right revealing a breathtaking view of Mount Rainier. At the Henry M. Jackson Memorial Visitor Center (I1) you’ll find extremely informative exhibits on the history, geology, flora and fauna of Mount Rainier. Participate in one of the many ranger-led programs and/or get hiking information on trails for every endurance level. There are many easy hikes on paved paths that will bring you in what feels like an arm’s length away from the peak. Each season brings stunning panoramic views. In spring you’ll find the mountain still has quite a bit of snow, making a traditional hike more challenging. From mid-July to August, the sub-alpine meadows dazzle with colorful wildflowers such as bear grass, alpine aster and scarlet paintbrush. Although winter poses driving hazards — if you’re prepared with mandatory tire chains — you will be rewarded with a magical landscape draped in white, where you can enjoy cross-county skiing, sledding and snow-shoeing. Or take an easy ranger-guided snowshoe tour (snowshoes are available on-site for a small donation). Be sure to check weather and road conditions before heading out. One can easily spend an entire day at Paradise in any season, so you may want to consider camping or staying nearby to fully enjoy all the mountain has to offer. After enjoying Paradise, our drive heads towards Sunrise by backtracking down Stevens Canyon Road to WA-123. If you were so inclined, you could head east on Stevens Canyon road, which will bring you to Longmire, the Nisqually Entrance to the park and back towards WA-7. Once you are down Stevens Canyon Road, turn left onto WA-123. In ten miles, the WA-123 will intersect with the WA-410 and our drive continues north on WA-410. If you head South on WA-410, you would meet the Chinook Scenic Byway and more great views of Mount Rainier. Heading north on WA-410 for about three miles, the road to Sunrise will be on your left. On your way up, there are many opportunities for hiking. Sunrise (H5) will be sixteen miles from the WA-410 turnoff. The Sunrise Visitor Center is open from July to mid-September, and here you will find exhibits, interpretive programs, hiking information and a picnic area. At 6,400-feet of elevation, Sunrise is the highest point that can be reached by vehicle in the park offering majestic views of Mount Rainier, Mount Adams and more of the Cascade Range. Our drive officially ends at Sunrise. If you are interested in other mountain scenic drives, continue on either the Chinook Scenic Byway or the White Pass Scenic Byway, which form a nice loop that will bring you back to this location. For a more adventurous drive, head down to Mount Adams.